Flexible Metal Hose Assemblies are a versatile solution for a wide range of hose applications including steam and high temperature service, high abrasion applications, or high corrosion service. Flexible metal hose assemblies can be configured from a variety of material types, grades, and sizes. Flexible stainless steel tube types include corrugated, interlocked, or packed interlocked. Tube materials include corrugated stainless steel, corrugated bronze, PTFE, and rubber linings. Stainless steel over-braid can be double jacketed for higher pressure, and can also be used to as a cover for many common rubber hose assemblies. Highly customizeable, metal hose assemblies can be designed to fit many challenging applications. 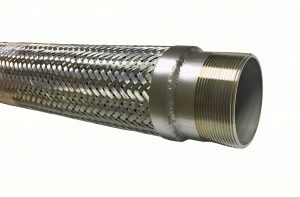 This hose material can also be fabricated into expansion joints and short length pump adapters in a variety of styles. Contact us to discuss the best material and customized configuration to meet your application.